Brewster High School Students Start "Girls Walk For Water"
Students in Mrs. Juska’s freshman English class at Brewster High School last fall read Linda Sue Park’s A Long Walk to Water, which connects the true story of one of the Lost Boys of Sudan with the fictional story of a Sudanese girl who walks two hours to a pond to collect water twice a day, Mrs Juska’s class was inspired to form a group called “Girls Walk for Water”. 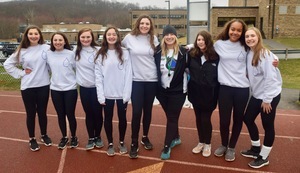 Those girls from the class decide to hold events around town to raise money and awareness on the issue and hopefully raise $15,000.00 dollars to help drill a well in a Sudanese village so the local girls can concentrate on education instead of walking miles for water every day. In December they had a screening of the movie ”Lego 2” at Empire Cinemas where the proceeds went to the cause. Boys in the class also got involved and held a bake sale a few weeks ago at Kobakers Market on North Main Street in Brewster. The boys donated the proceeds of that sale as well. Several of the girls are musicians and in December held a “Street” performance in front of Value Village in the Town Center Shopping Center. 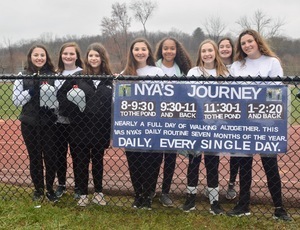 To date the girls have raised over $7,000.00 dollars for the cause. Last fall, we “travelled” to Sudan through our reading of A Long Walk to Water by Linda Sue Park. We were inspired to respond to the global issues that we encountered through our reading, particularly the desperate need for clean water in villages in South Sudan. Furthermore, we learned that girls in South Sudan forgo their right to an education because, instead of going to school, they spend their days walking to and from the water hole to retrieve water for their families. The water they retrieve is often dirty and diseased. We feel a strong pull on our hearts to sponsor a well in a village in South Sudan so that girls will no longer have to walk for water, and will instead be able to go to school. 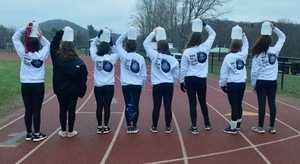 We designed a symbolic fundraiser called Girls Walk For Water. Like the girls in South Sudan, the girls in our class will not attend school on April 12. Instead, we will make the symbolic 6 hour “walk for water” on our school track. The design of this event captures our efforts to make the world a more equitable place for all.